About 400 films are made in the U.S. each year. Even more (600) are made in India. But, did you know that about 100 films are made in Indonesia each year? The Indonesian ambassador to the U.S., Dr. Dino Patti Jalal, and his wife were joined by the Singaporean ambassador’s wife, actor Nicholas Saputra (star of Joni’s Promise), and members of his staff during the first film showing. Recently, Dr. Jalal met with Hollywood director Michael Mann, who will be shooting his film, The Philosopher, in Jakarta. The film’s lead actor will be Aussie actor, Chris Hemsworth. This is a 75 minute film, but it packs some big punches. (It won many awards in Asia.) It focuses on the relationship between a transvestite streetwalker in Jakarta and a small-town/devout Muslim teen, who just happen to be father and daughter. Without telling her mother, Cahaya (Raihaanun), travels by train to see the father who left home many years back. Cahaya is dressed conservatively and wears a white hijab (headscarf). When she gets off the train, she stops at a mosque to wash and pray. She’s amazed by the sights and sounds of the big city, as she goes in search of her father’s address. (This film uses shadow and lights very well.) At the side of a bridge, she talks to some women (who are obviously streetwalkers). She meets Ipuy (Donny Damara)- dressed in long wig, sparkly red dress, and high heels (reminiscent of some of the characters in the films of Pedro Almodovar). Needless to say, they are both shocked. Ipuy wants nothing to do with Cahaya- his life is tough enough as it is. Most people look at him with disgust and treat him unfairly. What would a hijabi like her know about someone like him? (Eventually, Cahaya takes off her hijab, to make her father more comfortable.) She’s carrying a secret, which is giving her much worry. Cahaya exclaims that she needs a father to talk to about important matters. What she doesn’t know is that some gangsters are after Ipuy for stealing a lot of cash. This funny, light-hearted film is considered to be “one of the first comedies made in Indonesia.” (It reminded me of a French comedy.) 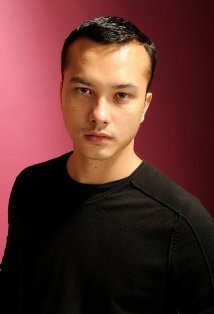 A 22 year-old man, Joni (Nicholas Saputra) delivers film reels- a job he likes and considers to be quite important. One afternoon, she sees a very pretty girl standing in line at the theater, but he’s too nervous to talk to her. We learn that she’s with her boyfriend (an entitled rich kid). She gets fed up with her guy, so she goes out. She notices Joni’s good nature and they have a chat. She doesn’t get her name or get give his out. The girl says that they can talk more of he gets done with his deliveries on time. Joni is happy with that- he’s never had a girlfriend yet. Joni’s motorbike gets stolen, he witnesses childbirth, gets a walk-on role in a film, plays the drums, and meets a mysterious artist. Can he make it back to the theater to have his first date? This is a full-length historical drama based on a trilogy of novels. The story focuses on the love between two young people in the village of Dukuh Paruk in Java. As a small child, the parents of Srintil are killed by some fellow villagers, who believed that they were poisoning food. The ronngeng (village dancer) also died- she ate the food. The teenaged Srintil (Prisia Nasution) and Rasus (Oka Antara) love each other deeply, though they are poor, illiterate, and don’t have many prospects. Rasus works in the rice paddy fields, like the other young men. However, Srintil thinks that she may have the spirit and the talent to become ronggeng. Her grandfather champions her cause, even though they are first met with doubt and derision. The local dance master won’t come to see Srintil perform. Rasus has a little dagger-like object which belonged to the former ronggeng. After he presents it to Srintil, everyone proclaims her to be the next ronngeng. She will not only dance , but belong to the village. Her virginity will be sold to the highest bidder- a fact that greatly upsets Rasus. (The elderly blind drummer is the only older person who senses what is going on with the couple.) Rasus runs away to the nearest town, then meets with a military commander (who thinks he could one day become a “loyal” soldier). While Srintil adapts to the lifestyle of a dancer, Rasus adapts to that of a soldier. His superiors look on him well and he finally learns to read. He crosses paths with Srintil on very few occasions. They only spend one more night together, but their lives must always be separate. When Srintil urges him to come back to the village and offers money to start his own business, Rasus refuses (too proud). A (Communist) man from the city comes to talk to the villagers, but they only want more food, and don’t grasp what allegiance to his ideas truly mean. (In fact, 1965-1966 was a very bloody year was Indonesia’s history. Many people, who were thought to be Communist or sympathizers, were killed by the military.) This man also wants Srintil and village musicians to perform at his rallies. Silver Linings Playbook / Kai po che!